Working on the Pieta today. It’s the most emotionally wrenching piece I’ve ever attempted, and that’s saying a lot. My early work was all about the difficult emotions. I know that I’ve been avoiding the most difficult parts of this painting. The more I work on it, the more I notice. Small details that give clues to the horror that brought us to this moment. I’ve been avoiding looking at what’s under the blood soaked t-shirt covering the boy’s chest, his flayed ribcage. I thought I might start with the boy’s foot. How bad could that be? But it’s dirty and damaged, he’s been barefoot a lot. How long? My heart hurts. I woke up this morning knowing I just had to roll up my sleeves and confront this. I flung off the sheet that covers the painting while our 6 year old is in the house, and stared it down with my hands on my hips. This father’s grief is what hurts the most. His face and hands tell so much about his pain. Eyes squeezed shut, mouth contorted into a grimance that you can barely see because he’s burying his face in the bloody t-shirt. I said to myself, that’s where I need to start. I managed to keep it together until Spotify decided I needed to listen to Miss Sarajevo. “Is there a time for high street shopping, to find the right dress to wear?” Realised I couldn’t squint as I measured the angle of his face anymore because I was crying. I wondered to myself, why am I doing this? This is causing me some substantial pain. My chest hurts and I can’t sleep. Then I thought about a paragraph I read in ‘I am Malala’ last night, where she talks about how the media helped spread words and stories around the world about the tragedies unfolding in Pakistan under the Taliban. That people were shocked by footage of men beating a teenage girl in the street because she was looking at lipstick in a market. It’s stories like this that open our eyes to what’s going on outside of our cozy lives in ‘safe’ countries. Donations and aid increased after the world saw that video. A friend and I was discussing our parents yesterday, and how they can’t acknowledge difficult events in our lives. We’re told not to ‘drag up the past’, or ‘blame’. Growing up around damaged people and alcoholics, there’s so much guilt and shame experienced by all parties, that understandably, no-one wants to stand up and say, “Tell me how you feel”, because no-one wants to hear the answer. We’re chastised and blamed for admitting to having demons, so the cycle continues. More resentment, more blame, more covering up. Maybe it’s the legacy of two World Wars, and the coping mechanism handed down through generations is still the go to solution. Keep calm and carry on. Ignore it, and it will go away. The trouble is, though, that those emotions never really go away, no matter how old you are, or how many miles you flee, and the deeper you try to bury the trauma, the more it finds insidious ways to rear it’s ugly head in your life. It’s PTSD. It’s cancer. You smack it down in one place, it comes back in another. To heal your history, you have to see it – all of it. Because you can’t heal until you grieve. 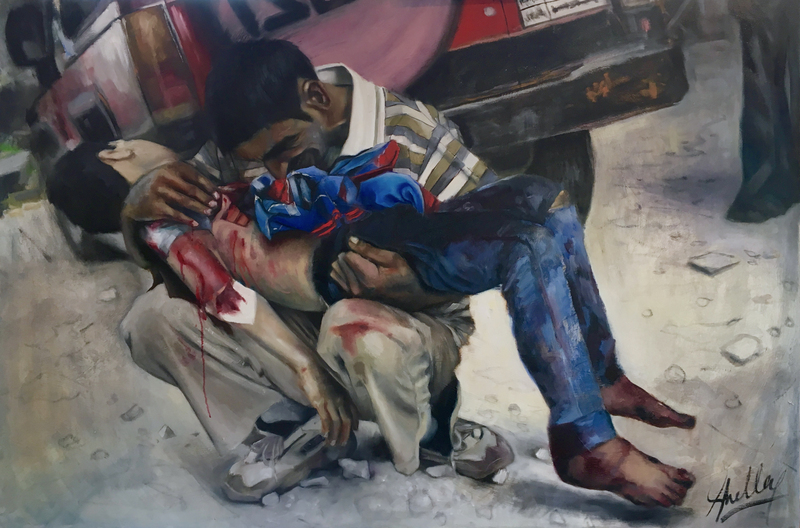 So, to paint this grieving man cradling his dead son, is my small way of acknowledging the pain of the millions of parents who have lost a child. It is my hope that people who see the painting will also see him, and other refugees like him, with open eyes and an open mind, and find the strength to open their hearts, and say, “I see you”.